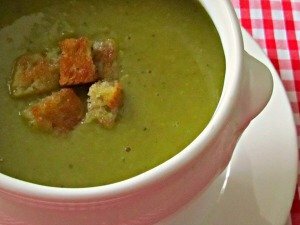 Yes this really is a fresh pea soup recipe that's so easy to make - you will want to make it one of your favourite recipes. It's lovely to make when the peas are ready for picking in the gardens but if you are like me and don't have that luxury you can buy them fresh in their pods from your greengrocer or supermarket. I often use frozen peas as they are a really good substitute and are plentiful all year round. You can make your soup with a good chicken stock if you have some or just plain water. My favourite is a good ham stock which I keep after having boiled a piece of ham. This is so delicious and small pieces of the ham can be added to your finished soup. It really is up to you which stock you choose but this soup is very tasty whichever method you prefer. Why not experiment and see which is best for you. There are many good stock cubes on the market too and most of us have some in our cupboards. When it comes to garnishing your pea soup, you can make some fresh croutons or sprinkle your soup with little pieces of crispy bacon. It is so good with crusty bread and of course freshly made French bread is always a winner. This pea soup recipe is great for family meals or for entertaining at any time of year – Enjoy! · Melt the butter in a heavy bottomed saucepan and add the onions or shallots, gently cooking them by sweating them until they are soft. · Add the peas, water or stock. · Add salt and pepper to taste and bring to the boil. · Simmer immediately and cook for about 20 minutes depending on the size of the peas as you may need a little longer if the peas are large. · When cooked, process the peas or blend them until smooth in a food processor or by hand blender and stir in the cream. · Heat thoroughly without boiling the soup. · Taste at this point and adjust seasoning to taste. · Serve hot with freshly made croutons.